That was actually harder than Cutstuff's. tbh I find Bad Box Art Mega Man adorable. Can't wait for Xover to actually be released, although the rest of the fandom seems to think the Mega Man franchise is going to die as soon as it hits Apple Stores. Wow, you actually had to do something in this flash game during a boss fight! Capcom should have made the original game's boss fight to be like this too. @Zerker We don't think megaman is dead when Xover hits, we think he's already dead, and this is just Capcom's sad attempt at ressurecting a zombie slave. What we need is for them to actually put effort and fun into his games so that he actually is ressurected. Alright, having actually played this thing now, I didn't find it nearly as fun as the Cutstuff mock-up. - Killing enemies was absolutely pointless in this game, as it didn't give you points, items, Experience, or anything. - The charge shot was a bit overpowered, since it could blow through everything without stopping, but I did like the classic series-style charge better than the one in the Cutstuff demo, since this one was quicker and only had two charge levels instead of four (two of which were useless). - I didn't like the fact there were keyboard shortcuts for the keys, given this is supposed to emulate a touchscreen game. - I liked the fact you didn't just have to sit there and take cheap shots from Storm Eagle and could even attack him during his attack (almost like Mario & Luigi: Superstar Saga in a way). - I still don't like the mixed spriting styles. I never have and I never will. All and all, it's cute, but it falls short of the original product despite being "more like Mega Man" overall. 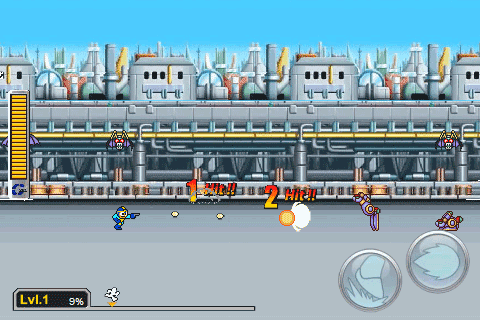 If the gameplay mechanics of Rockman Xover are like this, I'll eat all my words about how crappy this game was. But, I don't have hope about that.